Adding eLearning to your training is a great move! But are you fully ready? From defining the objectives of your eLearning program to understanding the types and tools, from deciding on a platform to choosing a content partner, from assimilating and presenting content to offering an intuitive UI – many factors must be considered. Many organizations fail to realize the benefits from their eLearning initiative because of a goal mismatch. The first step is setting and communicating clear goals to learners in a manner that is easy to understand and easy to act on. Have you analyzed your eLearning needs and identified the budget and time constraints? Are your eLearning course objectives clear? Do they include clear criteria for evaluation? Are the course requirements consistent with the overall objectives? Does the structure meet instructional goals? Pro tip: Great eLearning courses follow a thorough needs assessment. The goal of your eLearning program should be to impart training when your employees need it, and not when you want to deliver it. Start by identifying the “why” of your course early in the process. Don’t make a list of objectives based on what learners should learn or understand. Instead, state what learners should be able to do, on successful completion of the course and then determine how you will enable them to do it. Focus on impact, and if you cannot associate a real action to the course completion, it’s best to redefine your efforts. Another hurdle that is commonly faced concerns the technology platform. Today, eLearning must be easy to use and navigate. Functionality, thus, becomes top priority. If you do not offer an accessible and intuitive eLearning platform, you will find learners getting frustrated and demotivated. Not the best recipe to help them focus on the coursework! Pro tip: Leveraging eLearning requires some technical finesse; therefore, it is important to invest in the right technology. Consider hiring an eLearning partner who can help define the strategy and the nuts and bolts for you. Make sure to integrate your eLearning program with a functional Learning Management System (LMS), as your HR Management System (HRMS) and other enterprise systems. Also, make the course available on mobiles in bite-sized nuggets. This ensures a more engaging learning experience and greater personalization. That improves adoption and effectiveness. One of the most time-consuming aspects of any eLearning activity is content assimilation and distribution. You will have to make a decision on whether you want to use your physical training material for your eLearning program or start afresh with interactive and engaging content. One thing is certain – you will need to think long and hard before bringing together content for your eLearning and presenting it in a concise and relevant manner. Pro tip: Since today’s digital learners expect easy-to-understand content, offer an optimal learning experience that focuses their attention only on what’s important. Make sure to organize content in easy-to-consume and retrieve formats to enable the natural flow for learning that prevents cognitive overload. Everything in the course should be designed with intent; your course should allow the learner to focus exclusively on the content rather than trying to figure out how something works or where they should click. Not every learner learns at the same pace, or through the same content or format or the same device. Some learners may benefit from visual multimedia presentations while others may absorb text information better. Learning styles vary across different age groups, departments, demographics, and regions. Organizations that do not factor this in often find themselves failing at eLearning. Pro tip: One of the most fundamental aspects of effective eLearning design is creating engaging content that suits the needs of learners of all types. Analyze your target audience, and carefully understand their needs, background, level and breadth of experience, tech skills, competency level, motivation, and interests. The more you know about them, the more you can customize your program and improve the outcomes. Offer a responsive design that maximizes effectiveness across mobile phones, tablets, laptops, and personal computers ensures better retention and understanding of the material. Despite all the efforts you take to drive the positive outcome of your eLearning initiative, chances are you will still receive negative feedback. From poor content presentation to a non-responsive UI, hard-to-find course content to unclear objectives, poor navigation to unattainable deadlines. Such feedback can come directly from the users of mined from data analytics. 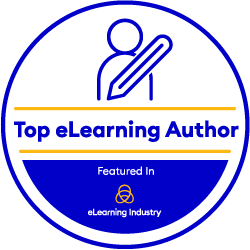 Organizations that don’t implement the suggestions and recommendations into the eLearning program are sure to fail. Pro tip: Every member of your extended eLearning design and development team should know what is expected of them and how they should address the course feedback. They should be aware of the deadlines and should have a detailed understanding of what they need to do to ensure the changes are made on time. It is only when you continuously review every aspect of the course, look at feedback positively, and make necessary changes that you can improve adoption and effectiveness. In a digitally-inclined world, eLearning presents a wonderful opportunity. The flexibility and ease of imparting knowledge and skills to an audience you could never reach in a classroom is what makes it truly worthwhile. If you’re looking to add eLearning to your training, you need to clearly state your objectives, use the right technology platform (and/or partner), assimilate and distribute the right content, take into consideration different learning styles, and implement feedback in a way that only improves the effectiveness of the program further. A little effort, and you’ll find yourself on the forefront of the eLearning revolution. Are you ready?